Discover the sublime scenery and fascinating history of ancient Kyoto during this half-day exploration of the city’s top sights departing from Osaka. Enjoy several of Kyoto’s UNESCO World Heritage-listed temples and its beautiful palaces, all set against the city’s ever-changing natural backdrop of forests that change colors with the seasons. Start your excursion to Kyoto with a pickup from select hotels in the early morning, proceeding to a central meeting point where you’ll head to Osaka station for the short ride to Kyoto by train. Soon you arrive in this historic Japanese town, an urban center that once served as the country’s capital and home to its emperors between 794 and 1868. Hop aboard your coach for the ride to your first attraction, the massive Nijo Castle. This UNESCO World Heritage site was home to the Tokugawa shoguns for close to 200 years after its construction was completed in 1603. Admire the castle’s imposing stone walls and large defensive moat, before heading inside to view its beautiful murals of gold leaf. A number of fantastic photo opportunities will be available at the castle, thanks to the complex’s photogenic groves of plum and cherry trees. 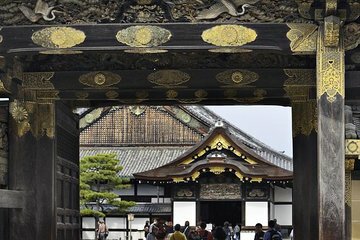 When Nijo Castle is closed, the tour will visit Ryoan-Ji Temple instead. Head next to the elaborate gardens and beautiful buildings at Kinkaku-Ji Temple, another UNESCO World Heritage site. After checking out this amazing structure, also known as the Golden Pavilion, you’ll move on to the Kyoto Imperial Palace for more sightseeing. This elegant palace, once home to Japan’s Imperial Family until the capital was moved in 1868, emphasizes the Japanese interior design philosophies of simplicity, tranquility and purity. You’ll also have a chance to see Shishinden imperial state chamber, where the country’s enthronement ceremonies once took place. When the Kyoto Imperial Palace is closed, the tour will visit Kitano Shrine (Kitano Tenman-gu) instead. This famous religious monument, dedicated to the god of study, is a frequent site of patronage for many Japanese students, who pray for luck in passing exams by touching the site’s statue of ‘Ushi-san’ (Mr. Cow) representing the virtues of scholarship. Finish your Kyoto excursion with time for a buffet lunch (at your own expense) as well as some time at the Kyoto Handicraft Center, affording you an opportunity to purchase some traditional souvenirs. The tour ends with a return ride to Osaka by train, at which point you will make your own way back to your hotel. This was enjoyable if you're looking for a short taste of Kyoto. The problem, however, is that other tourists on the tour were late and didn't stick to timelines, which cut short our time at the next destination. The first delay was picking up a group, who were more than 20 minutes late. At another point, a small group was 15 minutes late. The tour company should be clear that if you're late you are left behind - because it ruins the experience for the rest of the people on the tour. Ignoring the behaviour of the other people on the tour, the guides are very friendly and knowledgeable - an enjoyable experience.One thing to note is that people who sign up for the half day tour do NOT get the lunch that is mentioned in the description of this tour. What happens is the people on the half day tour are taken back to the train station while people who are on a whole day tour are taken to the restaurant. I personally did not mind, however the tour does state that lunch is included so I want to let other people know in case that's a deal breaker for them. Got to see a lot of stuff, I especially liked going to the Golden Pavilion. The trip was planned out very well and I had no issues figuring anything out because it was super easy to follow and understand. The tour guide was very knowledgeable and informative but we felt very rushed throughout the tour. The tour description stated that the tour included shopping at the Kyoto gift exchange and an optional lunch but when asked about this was informed that if we wanted to do this we were responsible for our own travel back to Osaka. We were very disappointed that the tour description was different then what we actually were offered. Because of this would not recommend this tour. Great Tour. Well organized and great value but that's Japan. A great way to see few nice spot of Tokyo get to go on the Bullet train. Great value as the 1 way bullet train cost alone is probably half of the tour cost. Lunch was good too as we opt to include lunch if you like Japanese food. The inside of Nijo Castle was beautiful. Kyoto Imperial Palace was majestic. Kinkakuji Temple was amazing, the walk around the grounds was breath-taking. Very good tour. A guide met us at a hotel in Osaka and accompanied us on the JR Special Rapid train to Kyoto Station. At Kyoto Station we joined up with the tour guide and more participants in the Kyoto Morning Tour. The tour bus left from Kyoto Station. We took the morning tour on a Sunday morning. This was good as we were able to avoid the crowds at the three major attractions. Although this was by design a short, half-day trip, it definitely covered some of the must see locales in Kyoto. Our itinerary had us staying in Osaka, but we were advised that Kyoto would provide some better sights and history, so we signed up for this trip, which had us take a bus to Kyoto and a train back--that said, we actually had a tour guide with us for the train back, so there were no issues finding our train which would have been relatively straightforward anyway--Japanese train stations can be daunting, but are well-signed with plenty of English-speakers to assist wayward travellers. All 3 specific locations visited were amazing, and the guide was extremely knowledgeable and spoke English fluently--a marvelous time!